The booze cooks out. Or does it...? I know, I know - I just did a strawberry pastry recipe blog! But today's National Strawberry Day...you couldn't expect me to let it pass up, could you? 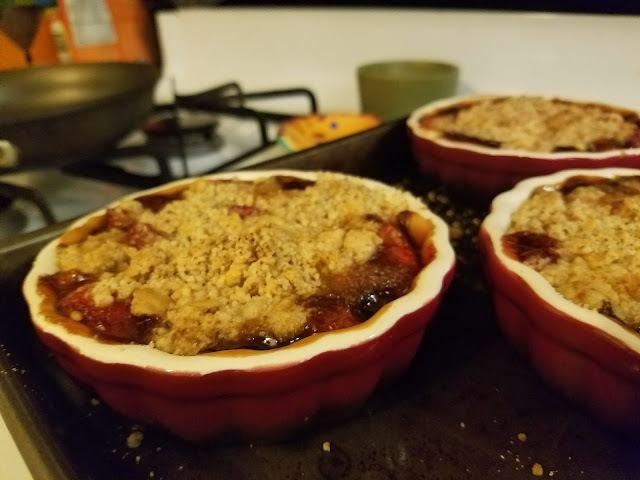 I love cobblers because they can cover the same flavor profiles of pie with less-than-half of the struggle. They're the ultimate fast food when it comes to dessert! The best part is that it can be just thrown together with nigh-anything and turned into something delicious. What makes a drunken strawberry? Soaking it in rum, of course! I have spiced rum in my cabinet (leftover from the holidays) but you can use bourbon, too, if you have it. Just make sure that your liquor of choice has a flavor of its own; otherwise, what's the point? 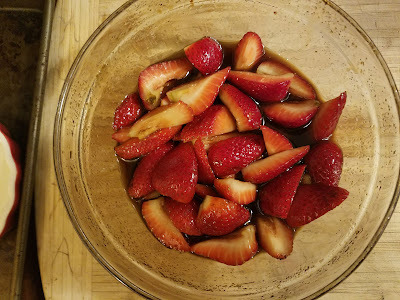 While you can quite easily throw this together in moments, I like to let the strawberries soak in the rum while the oven preheats to 350 degrees F. Honestly, simply toss everything together and let sit until the oven is hot, and you're fine. For the struesel topping, you can simply stir everything together with a spoon. If you want a touch of extra crunch, crush up some vanilla tea biscuits (I like Kedem's kosher pareve biscuits) quite fine and stir in. Simply grease your ramekins, divide evenly, add topping, and bake for 20 minutes. Let cool to gel in the fridge, if you like, or eat warm. Yum! See how quick that was? You didn't even need to scroll. Enjoy this rapid-fire recipe - and, as always, share around and leave comments below if you try it!